The Helena Brewers broke out their bats Thursday night to win their first Pioneer League title since 1996. Designated hitter Cody Hawn collected two home runs and a career-high eight RBIs in the 14-3 rout of the host Ogden Raptors. Helena swept the Rookie-level Finals in two games. 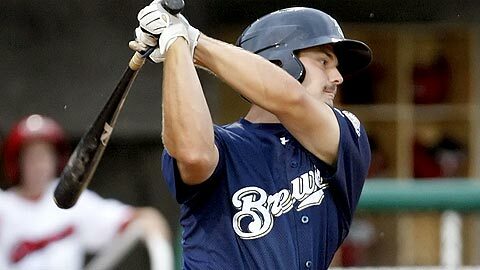 A sixth-round pick out of the University of Tennessee in June, Hawn led the Brewers with 13 longballs and tied for the league lead with 61 RBIs in 65 regular season games. He had never driven in more than four runs in his 69 games as a pro. "I had an eight-RBI game in college that was actually pretty similar, with a slam and a two-run homer," Hawn said. "But to do it in a championship game is extra special." Hawn's huge night eclipsed the seven RBIs that Orem's Casey Haerther collected in the decisive third game of the 2009 Finals, in which the Owlz beat the Missoula Osprey, 13-10. The Raptors led the league in hitting (.298), scoring (494) and home record (26-12) and had All-Star right-hander Red Patterson on the mound. They had also gone 6-1 against the Brewers during the regular season. But from the first inning on Thursday, the game was all Brewers. After leadoff man Rob Garvey struck out, Shea Vucinich -- who entered the game 1-for-15 in the postseason -- singled to left field. Hawn followed with a two-run blast to left. Helena went down quietly in the next two frames, but sent nine men to the plate in the fourth, scoring six runs on four hits, a walk and a hit batsman. The inning was capped by Hawn's two-out grand slam off Raptors reliever Jake McCarter. "Both [home run pitches] were up and away. It seemed like they were trying to pitch me that way in Game 1, so I went with it and tried to get good wood on them," Hawn said. "And it helps to come up with runners on base." The Brewers struck again for six runs on six hits in the fifth. Hawn delivered a two-RBI single with the bases loaded. Helena's own All-Star starter, Matt Miller, held the Raptors scoreless for four innings before yielding a three-run shot in the fifth to Nick Akins, who led the circuit with 15 regular-season homers. Miller (2-0) went five frames, allowing three runs on six hits. He fanned four and walked a pair. Helena reliever Eric Marzec tossed a hitless sixth, followed by Jimmy Nelson, who scattered two hits and two walks over two scoreless frames. Southpaw Brian Garman struck out one in a perfect ninth. Hawn, who batted three times with the bases loaded, was robbed of perhaps two more RBIs when Ogden second baseman Casio Grider made a diving play on his sharply hit grounder in the sixth. Hawn was hardly alone in battering the Raptors pitching staff. Carlos George collected three hits, Michael Walker singled twice and drove in a pair of runs and Vucinich scored three times. The Brewers went 7-for-15 with runners in scoring position and outhit Ogden, 15-8. Kenneth Allison, who went 2-for-5 with a double, was one of a handful of Brewers to win their second championship of the season. He was a member of the Arizona Rookie League Brewers, who won their league title on Aug. 31. Patterson (0-1) took the loss for the Raptors, allowing six runs on seven hits in 3 2/3 innings. He fanned five and did not walk a batter. Helena manager Joe Ayrault, the co-Pioneer League Manager of the Year, captured the crown in his first season in the Milwaukee organization. He spent the previous three campaigns managing the Sarasota Reds in the Florida State League. He guided the Brewers past the circuit's top two regular season teams -- Great Falls and Ogden -- to capture the Bob Wilson Trophy. It was Helena's fourth Pioneer League title overall and first since beating Ogden in the 1996 Finals. The club also won in 1984 and 1995. For Hawn, the whole championship season was special. "The last three months been above and beyond everything I thought and hoped," he said. "There was something special about this team. Even back when we started, we had a unique chemistry. They're a great bunch of guys. It makes winning tonight that much better."